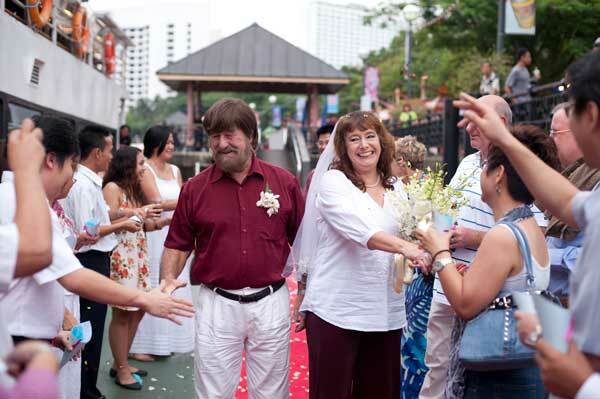 ROMANCE IN THE TROPICS: Guests welcoming Jill Henry and her husband John at the specially themed Mamma Mia Wedding Party on the Sarawak River Cruise vessel. AUSSIE Jill Henry is a woman with good ideas, energy, vision and a readiness to take a risk. Having worked with the Perth Convention Bureau before, she was specially commissioned by the Sarawak government to set up Malaysia’s first convention bureau. She has been the chief executive officer of the Sarawak Convention Bureau (SCB) for the past five and a half years. Her adventurous and exceptionally memorable journey with SCB ended at the end of last year. Under her watch, SCB had positioned itself as a leading Asian convention bureau and established a solid base for clients to access government support and industrial assistance. Furthermore, SCB’s marketing prowess has been recognised worldwide as the best, winning nine international awards for its destination videos and campaigns. Since 2006, the bureau has secured over 180 conferences for Sarawak, bringing in about RM189 million in direct delegate expenditure. Last Friday, Jill was awarded the Darjah Gemilang Bintang Kenyalang Sarawak – Johan Bintang Kenyalang Honorary – in Miri. She will be returning with her husband John Henry to Perth where they will re-establish their home which has been rented out for the past six years. After settling in, they plan to publish a book on travel adventures. Jill believes the job of a manager is to create an environment for people to excel, and empowering employees is essential to get results. True to the saying ‘you reap what you sow’, empowerment means allowing employees to have inputs and control over their work, and the ability to openly share suggestions and ideas. Her advice is simple: “The most effective leaders understand they don’t need to be the best in everything and they can’t do everything themselves. Surround yourself with creative and powerful people. Give them the environment to get on and do their job. Much like a relationship between parent and child, Jill allowed her team to go out and make their own decisions while standing behind them even if they might make a wrong decision. And like a mother, she was always there for advice, perspective and guidance. Jill believes that making work fun and allowing for some risk-taking provide an environment for employees to develop and grow. for a nursing convention. They were overjoyed to win it but failed to see it through by signing the contract. While winning bids relies heavily on the right strategy and correct timing, that one mistake taught them to close the deal immediately with all documents signed and sealed before opening the champagne bottle. Jill pointed out that it was important to put oneself in the shoes of clients, understand them and know what they wanted. 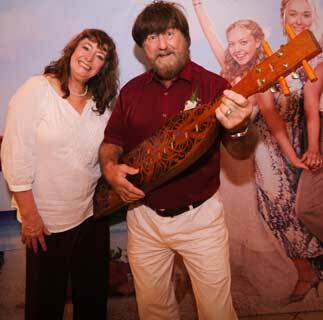 HAPPY COUPLE: Jill with John playing the sape. When Jill arrived here in May 2006, the SCB was not formed yet. Given a more complex government system here, the biggest challenge she faced was the amount of bureaucracy and time it took to set up an organisation. She learned the process of setting up and building a business here required a huge amount of patience and strong determination. For Jill, patience is not about waiting but how you act while waiting for the excitement that is about to begin. On arrival in Kuching and having just gotten over her jet lag, she was required to get on a plane again and head to Frankfurt for a trade show called IMEX. But to be part of the show, Jill and her team could not possibly turn up empty-handed and thus had to get ready everything because she was not only representing SCB but Sarawak as well. Fortunately, she had a good right hand in Chew Chang Guan who had worked with the Sarawak Tourism Board before joining SCB and was familiar with the ways of doing things in Sarawak. With all the cash but no bank account yet, the funny part was they ended up putting the money in Chew’s personal bank acount. This was how it all got started and the rest, as they say, is history. 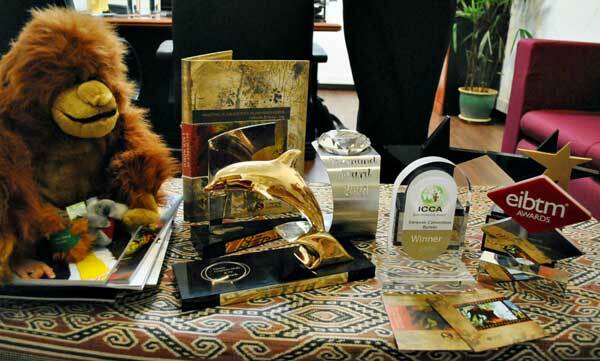 COLLECTIONS: Some of the awards and promotional materials. The secret to SCB’s success in breaking into a very big and highly competitive global market, considering Sarawak is a very small destination and pretty much unknown to others when Jill first arrived, lies in the opportunities given to try things out and do things differently. One of the notable achievements of Jill’s team is SCB’s destination short film Meet in Sarawak: Recharge in a New World – Changing Perspectives which won the most awards. The film tells of a climactic meeting between jaded western business executives and unique local hosts from the Sarawak Iban community, aimed at positioning Sarawak as a new and vibrant business destination where traditions are still upheld but in tune with the ethos of today’s fast-paced business world. The film won the Diamond Award at ITB Berlin 2008; the Gold Camera Award 2008 in Los Angeles; the Pata Gold Award 2008 in Macau; the Best Marketing Award 2008 in Canada; the Best Marketing Campaign Award 2009 in Spain; the Phoenix Award (Bronze) 2009 in Singapore; the Silver Award at ITB Berlin 2010; the Silver Camera Award 2010 in Los Angeles and the Gold Award for Tourism Film in Cannes Corporate Media and TV Awards. Jill said the focus was not so much on the actual awards although getting the international recognition was the icing on the cake. The film uses story-telling to communicate with customers because a good tale makes and leaves compelling impressions. 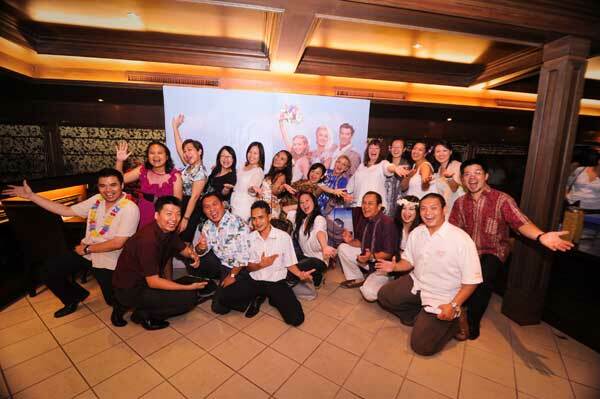 “We use the fabulous story of the people of Sarawak coupled with humourous elements to convince people to come here. We poke fun at people and laugh at ourselves. Now that the story is out in the world, there is no telling where it will end or what will happen to it. But the short film that bagged numerous international awards showed “they got it right”. ALL THE BEST: SCB team with Jill Henry (back row fifth right), and SCB chairman Dato’ Sri Dr Muhammad Leo Michael Toyad Abdullah (front row, third right). Jill and her husband love being surrounded by the serenity of the rainforest, waking up to the fresh smell of earth and trees and the sound of little animals singing outside. Her favourite foods are cangkuk manis, midin, fish, sea cucumber soup and laksa, just to name a few, but not belacan and durian – perhaps due to her bad first encounter with them. This adventurous couple explored Sarawak from top to bottom – by land as well as sea. They had seen more of Sarawak than any locals might have. “We’ve been all over because we have a small boat. We travelled all the waterways in Kuching and went out to Sematan a lot. Jill said she must come back to visit Mukah, the only place in Sarawak she has not been to. She said she had enjoyed every moment working with Sarawakians and was full of praise for the local private companies as they moved very quickly to get things done in a given short time. However, when it came to people who refused to talk about their problems, especially business-related, and those who prided themselves on their politeness and find it hard to refuse, it got her mad. Jill said it was important to speak up when problems arose rather than concealing them. Indeed, all of us have one or two things to learn from Jill Henry, especially on being brutally honest when necessary – and never leaving things idle until it’s too late.